If you’d like to have the opportunity to visit Rome, but at the same time spend a relaxing time in the countryside, Vigna Licia is the place for you. Vigna Licia is only 18 Km from the centre of Rome and 9 Km from the ring road called the GRA (Grande Raccordo Anulare). The house is surrounded by a luxuriant garden full of palms, pines, Lebanese Cedars and olive trees. The property is in the heart of the Decima Malafede protected area, the largest protected natural reserve in Europe set in an urban landscape. The apartment is on the first floor and is made up of a living/dining room with bed sofa, one double bedroom, two single bedrooms. The kitchen has a four-ring hob and an electric oven with grill, dishwasher and fridge/freezer. Bathroom with shower. Satellite-TV and radio/cd. Bed linen, towels, tablecloths, dishtowels etc. are provided. There are large furnished terraces. A laundry room is available for guests as are the five-a-side football pitch, a swing, children's games, table tennis, bicycles and a communal parking area. A child's cot is also available. "On était très bien, endroit superbement situé pour être tout près de Rome tout en logeant à la campagne. Jardin, piscine, jacuzzi vraiment agréable dans la chaleur de l''été. Accueil très sympa de la propriétaire. Nous avons aussi apprécié d''avoir accès à internet et imprimante. Le petit plus : la gentillesse d''Eli, le gardien. Nous avons mis du temps à écrire cette appréciation mais avons déjà recommandé l''endroit à plusieurs amis. Merci, grazie !" "We had a really lovely time staying at Vigna Licia and would definitely stay here again. The apartment is on the top floor of the large villa, benefitting from two large balconies. It is very clean, well furnished and equipped. It is very helpful to have use of the washing machine, dishwasher etc. The grounds are lovely, and immaculately kept, overlooking lovely countryside. There is plenty of comfortable garden furniture. The pool is a real bonus and we enjoyed daily swims after sightseeing in Rome and the surrounding area. We hired a car and thoroughly enjoyed exploring the area. Thoughtful touches such as the welcome bottle of wine and home-made Limoncello were much appreciated! Thank you." beautiful apartment with fantastic park and pool. A quiet paradisw in the nature and greenery. Nous sommes restés 15 jours dans cette résidence. L'accueil de Licia a été parfait : très sympathique et attentionnée (avec des conseils précieux pour les visites). Le cadre est très agréable (très grand jardin, terrains de sport et de jeux pour les enfants) et permet de passer un séjour reposant après les visites à Rome. Maison très agréable dans la campagne romaine. Le seul petit bémol (mais qui n''est pas lié à la maison): on est un peu loin des transports. "Lieu de vacances idéal pour une famille qui souhaite visiter Rome en plein été. L''accueil est chaleureux et attentionné. Tout est bien pensé pour les jeunes enfants (attention pas de pataugeoire). Prévoir des protections contre les moustiques. A recommander." here is a good public transport service connecting Vigna Licia with the centre of Rome. You can spend a relaxing holiday in the country and still be in the immediate vicinity of Rome. Vigna Licia is only 18 Km from the centre of the city and 9 Km from the ring road (GRA). The sea is also not far with the beautiful beaches of Torvaianica and Pratica di Mare only about 15 Km away. The Roman castles in the villages of Rocca di Papa, Grottaferrata, Albano and Ariccia, the spectacular summer residence of the Pope and some fabulous lakes are only 15 Km away. 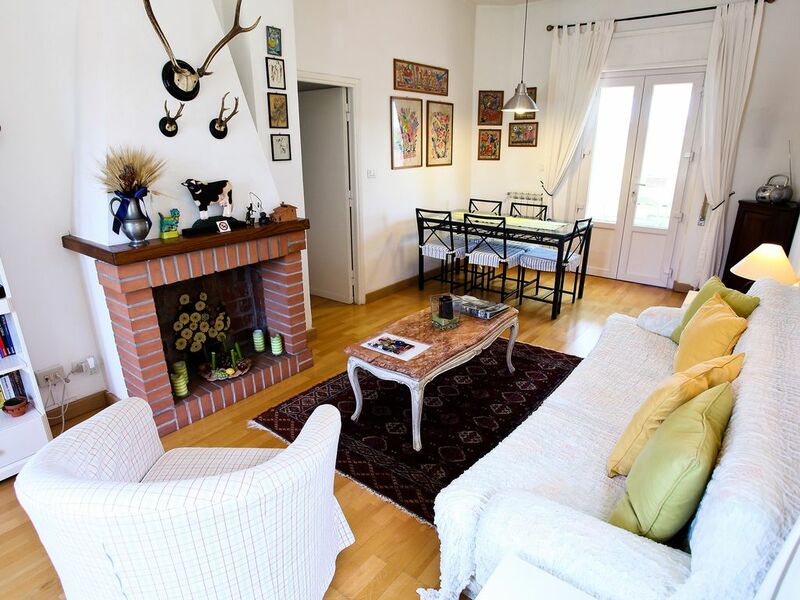 In the area immediately around the house there is a riding school, some tennis courts and a public swimming pool not to mention the opportunities to go jogging or have a walk in the countryside. Richiesto supplemento per il riscaldamento in base alla stagione (€ 1,00/mc gas) Heating under request € 1,00/cubic meter gas Chauffage à demande (€ 1,00/mc gas) Heizung nach Verbrauch (€1,00/kubik meter gas).